Guests want to feel welcomed upon arrival in every sense, therefore, success in the hotel industry is all about having the right look and feel from the minute guests arrive on the property, and for sure, once they hit the door. Whether for business or pleasure, when travelers arrive at your hotel, you want them to feel calm, relaxed, and welcome. The appearance and design of a hotel while fundamental are critical to the overall guest experience especially if you are looking for return trade. The hospitality industry is a highly competitive and an ever-evolving market in which first impressions count. Hotel general managers and owners are finding new ways to improve the aesthetics of their hotels, and one visual component that is increasing in popularity is the addition of live plants, appealing containers and other interior landscaping features from earth walls to living walls, which all add style, decadence, and comfort. Your staff works hard to give each guest the best experience, but did you know that live plants can also work towards providing exceptional service? Live plants in the reception area create a central focal point in a lobby and are also seen synonymous with luxury. Impressive indoor plants add ambiance to a room and help guests feel more at home and relaxed. Here’s a look at three benefits of indoor plants in hotels. A wide variety of plants have been used for multiple benefits in hospitality settings for centuries. What most don’t realize is that there is scientific data that proves why plants and such tactics are crucial to the hospitality industry’s vitality.In addition to aesthetics, extensive research has shown that all plants can have numerous beneficial qualities including reducing stress, improving humidity levels, reducing background noise as well as improving employee productivity. The University of Georgia has added its weight to the argument for interior landscaping. 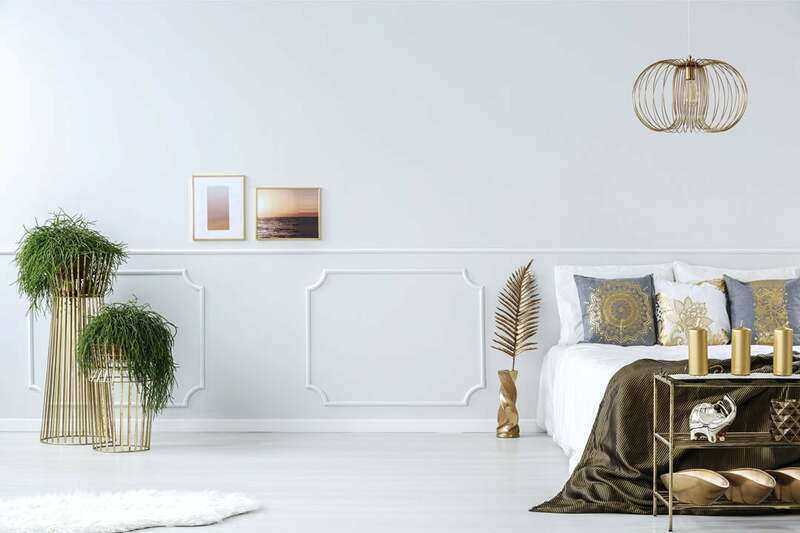 Conducting a detailed study on the benefits of plants and interior landscaping their study states that interior plants remove carbon and other impurities from the air that we breathe. Research undertaken by two scientists at the University of Georgia over the course of a year in a number of different environments has allowed them to monitor and prove that plants absorb carbon and remove pollutants and VOCs including benzene and formaldehyde. All plants remove carbon from the air, but larger, woody-stemmed plants absorb and retain more carbon than small herbaceous plants. A lobby that is flush with fresh, live plants is a sharp contrast to travel-weary guests who have made their way through dirty airports, crowded trains, and harsh city conditions. One of the best benefits of hotel lobby plants is their ability to strip toxins from the air and replace them with oxygen and a fresh scent. Stepping inside your hotel will be a breath of fresh air and your guests will instantly relax and begin to feel at home. Traveling can be a stressful activity, even if you’re on vacation or revisiting a favorite destination. A study from Washington State University found that plants can directly reduce stress levels when used indoors. Other psychological lifts your guests will enjoy are an improved mood and sense of well-being and increased feelings of calm, relaxation, and optimism. Because they feel better, your hotel will leave a positive impression on our guests. The will recall the hotel visit as pleasant. Your business travelers may be preoccupied with their work instead of thinking about the benefits of hotel lobby plants, but you can secretly help them achieve better success. Indoor plants and flowers have been shown to improve idea generation, improve memory retention, and boost productivity. They might not know why everything seems to work better when they stay with you, but business travelers will keep coming back to enjoy their professional success. 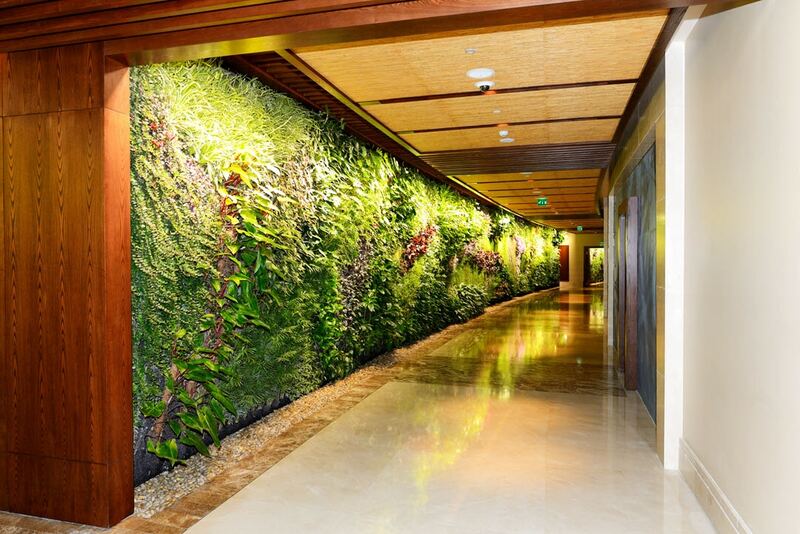 One great hotel indoor plant choice is a living wall. A vertical living wall adds to the overall well-being of guests by reducing stress, enhancing indoor air quality and improving mental health. From an aesthetic point of view, living walls add softness, texture, and warmth to public spaces. They also create an ideal layering effect and divide spaces without having to add hard surfaces. Living walls can take on a dynamic look with soft or ambient lighting to create a relaxing environment for guests. Featuring local flora and fauna gives guests an authentic taste of the surrounding landscape. For hotels interested in incorporating natural elements into their interiors, using real plants for the aesthetic benefits as well as the wellbeing of guests is best. Interior plants are thus an excellent design statement as well as being a proven good long-term investment. Reception plants and other foliage can keep the mood relaxed and calm while improving the aesthetics of your hotel and keeping your guests eager to return again and again. Because they create a relaxing mood and calm, and a sense of well-being, plants actually increase revenue per guest. Guests want to stay longer and return again and again, thus increasing repetitive business and increased occupancy. The goal of every hotel is to make their guests happy. When you have the right environment combined with excellent staff, you can be sure that your guests will feel great when they choose your accommodations. The benefits of indoor plants in hotels will not only make your hotel look inviting and beautiful, but they will also help your guests feel better and work smarter, so they keep coming back. Interior plants are an excellent design statement and a proven long-term investment. 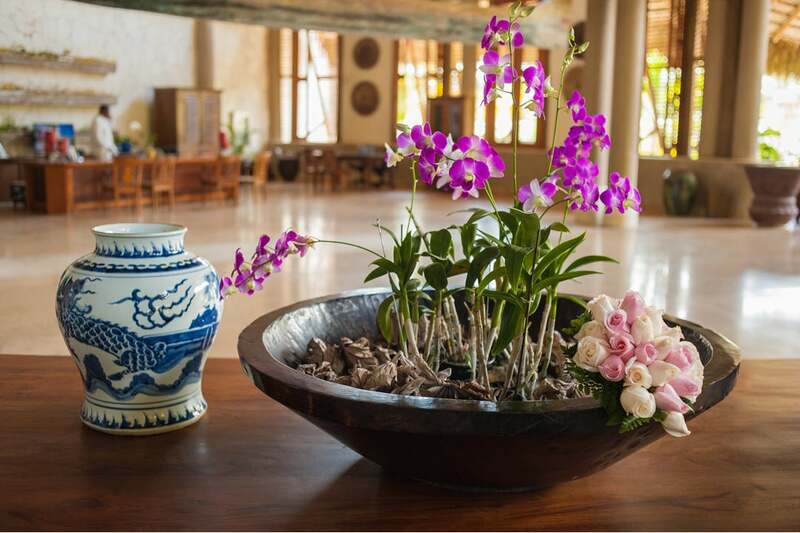 As soon as a guest walks on premises and into the hotel lobby, live plants and foliage will surround them with beauty and provide an overall pleasing first impression. Plants need to be in a healthy, well-maintained condition to actively remove carbon from the air within buildings that we breathe. The hotel may not have plant experts onsite at all times, but it can partner with a company who installs the plants and maintains and cares for the plants regularly to keep them looking fresh. An expert interior plantscaping company can not only supply you with beautifully maintained lobby plants but they will also be able to provide contemporary stylish planters and plant areas that are fully in keeping with your decor. The plant maintenance service also ensures that key hotel staff are left free to tend to the guests without worrying about the health of the plants. 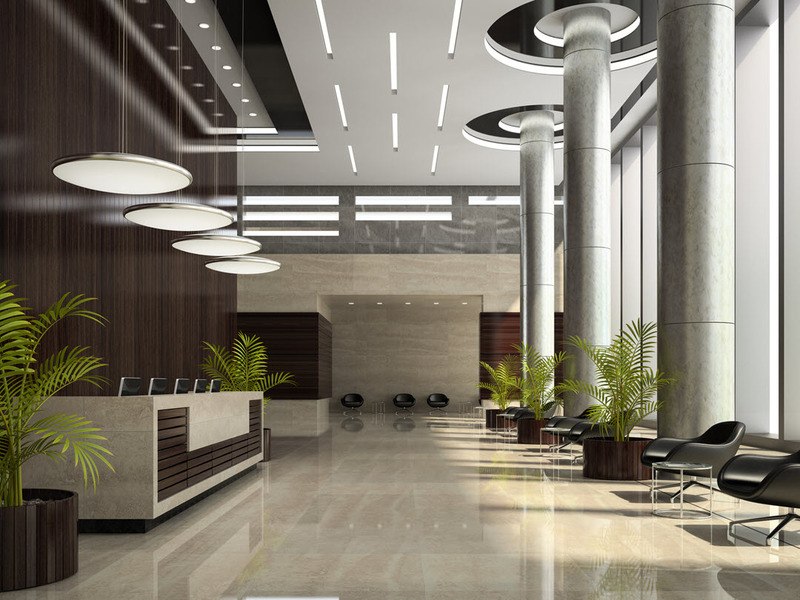 Inside Plants is the top commercial interior plant company in the area, offering a full design service as well as regular plant maintenance and care. For more information or to arrange a meeting with one of our experienced and knowledgeable plant design consultants, please give us a call at 951-371-4637.